Food, glorious food! Yes, that’s right, it’s time to talk about something that’s close to all our hearts. ‘Fine dining’ has gone through many transitions over the years and now more than ever, we find ourselves immersed in new and innovative dining experiences. In the digital world, food has become something in which the term ‘sharing’ doesn’t necessarily mean having to hand over what’s on our plate! Apps such as Instagram have become crucial in the ‘dining experience’ for both businesses and consumers. 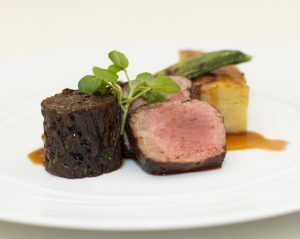 Here at 41 Portland Place we ‘share’ our plates as much as our ideas and encourage our guests to do the same. Hospitality at 41 Portland Place is in the capable hands of CH&CO whose chefs and nutritionists share a passion for fabulous food, as is evident in our autumn and winter menu. When it comes to fine dining, Head Chef Irmantas’s creative dishes not only score perfectly on taste but are impressively Instgrammable too! We know that sometimes the hardest thing is deciding what you want to eat. Don’t worry, we are here to help and these top picks from our seasonal menu should help settle your undecided mind. 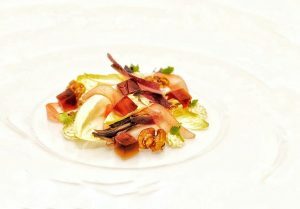 Why not start with our chicory, caramelised walnuts, blue cheese mousse and pomegranate molasses jelly, touched with a flourish of colour to bring a creative snap to the beginning of your evening. 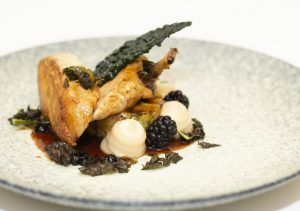 When it comes to the main stage, there’s the maize-fed chicken, roasted parsnip puree, black cabbage and pickled blackberries, or our delicious butternut squash, Shetland potato terrine, roast mushrooms, charred leeks and porcini powder, crafted and designed for vegan perfection. 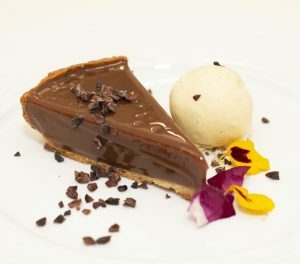 Last, but certainly not least, we come to desserts, the indulgent end to any fine dining experience. 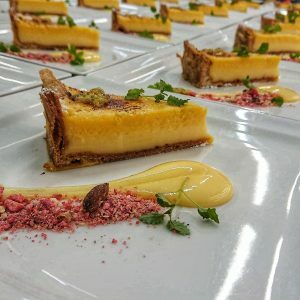 Those who like a spike of citrus to balance the sugar will not be disappointed with our passion fruit tart, with lemon curd sauce and hazelnut praline. For those who want to go all out, our chocolate genoise with dark chocolate ganache, caramelised pear and cocoa syrup is the must have on our list. 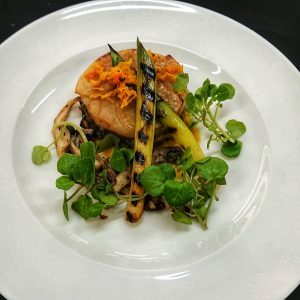 Our menus are handcrafted to fit the season and the ethos of 41 Portland Place, and these are only a few examples of how you can turn your dining into an unforgettable experience. 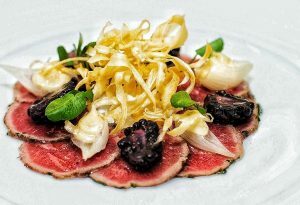 Don’t forget, we offer a bespoke service, so we are more than happy to help design the perfect menu for your event.